This very detailed map and busy map covers the northern part of Stockton, with coverage stretching from the cemetery eastward to St Ann's Hill, and from Mount Pleasant southward to Mill Street. Features include Stockton station, Newham Grange, West Stockton Iron Works, Westbourne Iron Works, Stockton Forge Works, NER North Shore Branch, North Shore Junction, Engine Works, Clarence Potteries, Portrack Lane Iron Works, workhouse, part of Stockton Malleable Iron Works, North Shore ship yard, cattle market, northern part of High Street. There are extensive street directory extracts on the reverse including Elliott Street, Portrack Lane, Thompson Street etc. 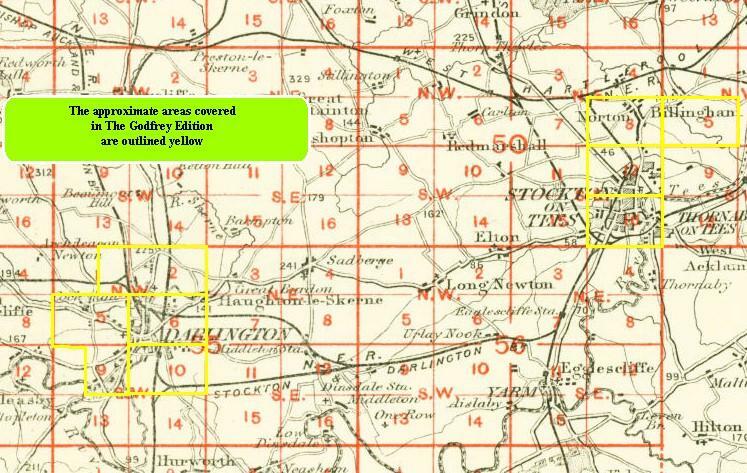 The map links up with Sheets 50.16 Stockton & Thornaby to the north.